Image caption Tha an MV Finlaggan tric air a bhith air an t-slighe eadar Ùige, Loch nam Madadh is an Tairbeart, rud nach eil air còrdadh ri gu leòr sa choimhearsnachd. Nochd beachd gur e bàtaichean-aiseig eadar-dhealaichte a bhios a' frithealadh Loch nam Madadh agus an Tairbeirt air a' cheann thall. Bha sin am measg iomadh cuspair a thog ceann is Ministear Còmhdail Riaghaltas na h-Alba, Derek MacAoidh, a' tadhail air Uibhist. Chaidh an turas a chur air dòigh às dèidh iarrtais bho chomhairlichean eadar Barraigh is Uibhist a Tuath is iad mì-thoilichte gu h-àraidh leis cho tric sa bha aiseagan dheth air a' Gheamhradh a chaidh. Dh'innis an Riaghaltas mar-thà gun tèid tè de na bàtaichean-aiseig ùra a tha a' tighinn thuca a chur air an t-slighe eadar Ùige, Loch nam Madadh is an Tairbeart. Às dèidh na coinneimh le Mgr MacAoidh ge-tà, thuirt fear de chomhairlichean Uibhist a Tuath is Beinn nam Fadhla, Uisdean Robasdan, gur dòcha gu bheil fuasgladh eile san amharc aig na h-ùghdarrasan air a' cheann thall. "Tha iad a' coimhead air seo mar rudeigin anns an eadar-ama. An aiseag a tha a' tighinn a-staigh às ùr, 's e aiseag a th' ann a tha cho mòr is cho freagarrach air sgàth Cidhe Loch nam Madadh, Cidhe an Tairbeirt is Cidhe Ùige aig an àm seo", thuirt an Comh. Robasdan. "Ach san ùine as fhaide, tha iad a' coimhead gur dòcha gur e an rud a thachras gum bi aiseasg air an dà shlighe. "Chaidh a thogail gum biodh e na b'fheàrr 's dòcha aiseag Loch nam Madadh a bhith a' dol a Dhùn Bheagain thoradh tha e nas fhaisge", thuirt e.
Thog an Comh. Robasdan cuideachd dragh às ùr leis a' mhinistear gun tèid am MV Hebrides a thoirt far slighe Ùige, Loch nam Madadh is an Tairbeirt a-rithist air a' Gheamhradh seo tighinn, rud a tha air tachairt tric roimhe is a dh'fhàg fearg air gu lèor sa choimhearsnachd. Thuirt an Comh. Robasdan nach d' fhuair e gealltanas idir gun rachadh sin atharrachadh ach gun do dh'innis Còmhdail Alba co-dhiù gun toireadh iad sùil eile air a' chùis. Nì iad sin às dèidh rabhadh bhon Comh. 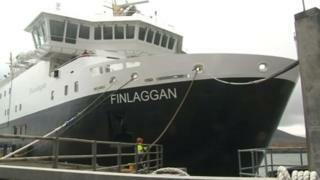 Robasdan gun robh "dragh uabhasach" air a' choimhearnsachd gun cailleadh iad an MV Hebrides a-rithist. Chaidh an t-seirbheis pìleat eadar Loch Baghasdal is Malaig cuideachd a thogail leis a' mhinistear. Bha mì-thoileachas mòr ann leis an dàrna bliadhna den t-seirbheis is i na tàmh barrachd na bha i a' seòladh. Thuirt Mgr MacAoidh gu bheil e mothachail dhan t-suidheachadh ach cha robh gealltanas aige a thaobh seirbheis pìleat a chur air dòigh tro mhìosan an t-Samhraidh. "Bha cho tric 's a bha an t-seirbheis dheth nas àirde na a' mhòr-chuid de shlighean eile far a bheil e 's dòcha 14% no 15%, mar as trìce mar thoradh air droch shìde", thuirt Mgr MacAoidh. "Gabhaidh sinn feart air buaidh na sìde am measg rudan eile nuair a tha sinn a' dèanamh measadh air an t-seirbheis seo sam àm ri teachd. "Tha mi an seo gus beachdan dhaoine a chluintinn agus rudan a ghluasad air adhart sa phlana chòmhdhail a bhios againn", thuirt e.